The Bahía del Duque resembles a fairy-tale village by the sea. The Bahía del Duque resembles a fairy-tale village by the sea, complete with pastel hued buildings (inspired by Tenerife’s late 19th-century architecture) and fifteen acres of subtropical gardens. Children find the resort especially enchanting, as it offers numerous programs to keep them entertained: besides the kids clubs, there’s also one geared to teenagers. Grown-ups can take advantage of three freshwater and two saltwater pools, as well as a host of water sports, such as windsurfing, hang gliding and scuba diving. Tennis and paddle courts are available for active types, while those in need of pampering can repair to the contemporary spa, with its open-air thalassotherapy circuit—the only one of its kind in the Canary Islands. A hotel where you can live happily ever after, indeed! With nine restaurants on the resort offering a wide range of cuisines, staying at the Bahía del Duque is like taking a gastronomic journey. 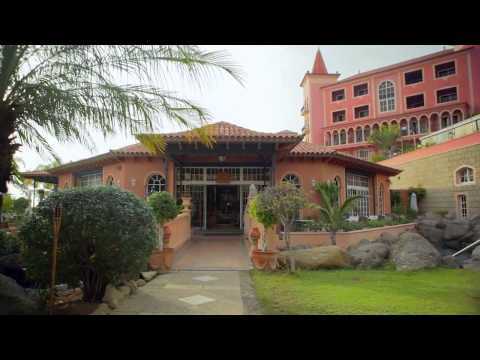 Situated on Duque Beach in Costa Adeje, an oasis of brilliant landscapes known as The Island of Eternal Spring. The award-winning Spa Bahía del Duque is an outdoor sanctuary known for its thalassotherapy treatments. Junior Suite Ducal Garden View 40SQM apprx, Open living room/ Free Wifi. Carnival in February is the island’s most celebrated festival. Over several days, lively carnival-goers in brightly colored costumes flood the city streets with festivities. This high-ceiling Canarian mansion serves up a mighty mean Mojito and other exotic cocktails, plenty of top shelf spirits, as well as those much-needed frosted beers and fresh fruit juices that beach-goers and promenade strollers crave at regular intervals. www.acantocostaadeje.com. One of Tenerife’s first villages (it was founded by the Spanish conquerors), this UNESCO World Heritage Site was the capital of the island until 1723. Don’t miss its beautiful cathedrals and churches. Set on Playa del Duque, this romantic restaurant serves fresh seafood dishes, like marinated tuna salad. Ask for a seat on the terrace, overlooking the sea. (34-922) 712-209; www.latorredelmirador.com. Thanks to a diverse set of microclimates, Canarian wines come in a surprising variety of complex flavors and from almost a dozen recognized terroirs. www.vinoscanarios.org. This world-famous animal park was originally conceived as a natural oasis for parrots. It has since become one of the biggest attractions on the Canary Islands. www.loroparque.com. This intimate Spanish restaurant serves a wide range of typical Castilian tapas, with an emphasis on high-quality meats and cheeses. (34-922) 796-305; www.mesoncastellano.com. Start at sea level and take a cable car up to Mount Teide, the highest point in Spain (12,200 feet/3,718 meters) and an active volcano—the third largest in the world. www.telefericoteide.com. This recently-opened, massive water park has an East Asian theme with lush landscapes. Book a lesson at the park’s surf school. www.siampark.net. Tenerife’s south-west coast practically guarantees a chance to observe pilot whales and dolphins in their natural surroundings. Charter a luxury boat and find colonies of these mammals year-round.